The #Blogtober14 prompt for today is your favorite quote and why. 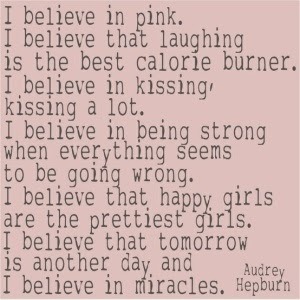 My favorite quote is by my favorite actress and humanitarian, Audrey Hepburn, and it's where I got the name for my blog. Originally, it was Happy Girls are the Prettiest Girls, and finally ended up being The Happy Girl Blog. And this quote? It's pure gold on so many levels. I love this quote because of everything it stands for. It says "it's OK to be girly and like pink. Laughing is better than any kind of exercise because it works your soul as well as your body. Kissing is important, so it often. Stay strong when things go bad. Being happy makes you pretty, not the other way around. Don't stop believing- in yourself, in what you love, in miracles. It's my motto for life, as well as my blog.